The tiny, fierce face of six-year-old Quvenzhané Wallis—filled with wonderment, serenity and a postapocalyptic tenacity that would shame Mad Max—might win you over to this rambunctious slice of fantasy, about a little girl called Hushpuppy living in flooded southern Louisiana. 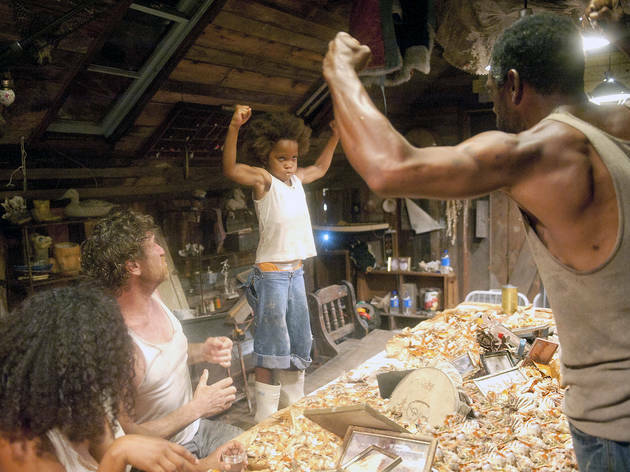 It’s everything around her face that may have you frowning: Hushpuppy’s hair is a hillbilly snaggle; her father, Wink (Dwight Henry), falls squarely into the shouty, semideranged category of cliché. Their surroundings—decimated cars converted into boats, kindly neighbors, a complete lack of pop detritus (save a Bulls jersey)—shriek of Screenwriterly Poetic Conceit. And the father-daughter duo’s misadventure on higher ground emphasizes a naive disparity that would have us root against modern medicine, charity efforts and, well, cleanliness. 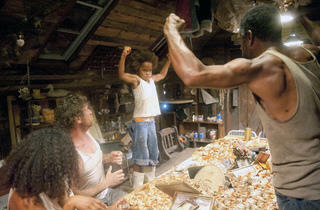 Beasts of the Southern Wild strongly cleaved opinion at last January’s Sundance Film Festival, a divide that speaks well to that annual showcase’s iffy reputation for adventurousness. But even if you’re swept up in the Malick-swaddled flow—equal parts George Washington, Winter’s Bone and, oddly enough, Spike Jonze’s Where the Wild Things Are—there’s a dangerous tweeness here. How can a movie so steeped in post-Katrina imagery eschew even the smallest comment about social responsibility? Maybe that was deemed too earnest, a decision that makes zero sense when a twinkling score (cocomposed by director Benh Zeitlin and Dan Romer) is ladled on like instant pathos. Real people aren’t beasts, nor do they require starry-eyed glorification. Bring your liberal pity.